In the immediate aftermath of an earthquake, search and recovery efforts will be on the way and conventional communications and mobility are usually disrupted or destroyed. As a radio operator, you may be the only one to get the status and effects of damage in your area reported in a timely manner. This is critical to better help emergency services know where to concentrate their limited resources and energy. The AmRRON network has added a County Status Report Form (STATREP) form. This for was designed to simply and efficiently report conditions within a county to the appropriate authorities. (HTML forms are imported into your NBEMS custom forms folder for use over the radio using digital modes). When an earth quake strikes, you may not know immediately where the epicenter is, nor the magnitude in terms of Richter Scale readings. What you do know is the effects you felt and observed. 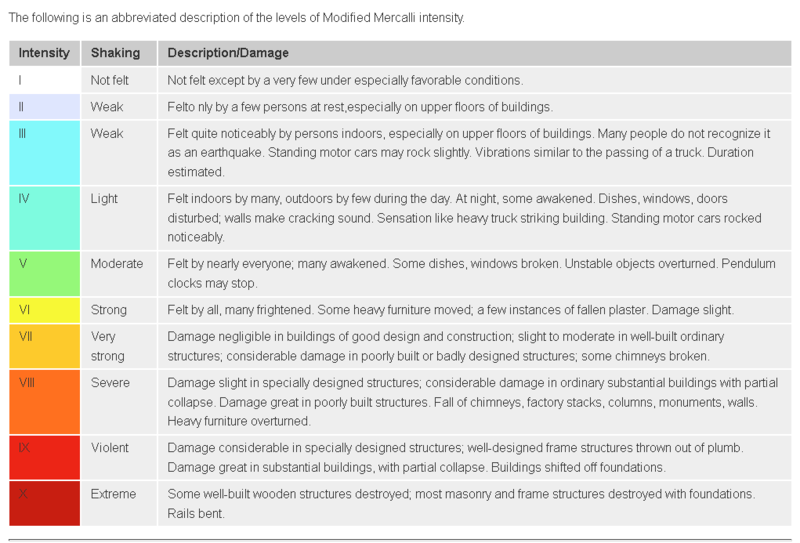 The Modified Mercalli Intensity scale is a tool that anyone can use to report the effects of an earthquake in their immediate location. Even if conventional communications, commercial radio and television, and internet are disrupted, the reports sent in by radio operators can provide great insight as to the size and scope of the incident. When reporting using the Modified Mercalli Intensity scale, it should normally be part (Line 8) of the AmRRON County STATREP custom report. The Mercalli scale can also be used to report major explosions, such as a nuclear, dirty, conventional massive ordinance, or other bomb. HOW TO USE: Simply read the description in the right column of the charts to locate the one that best fits what you experienced. In some cases there can be some overlap. 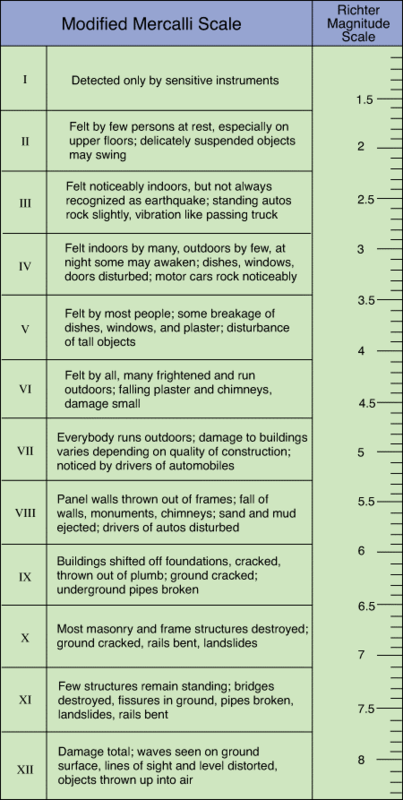 For example, if the description in intensity levels 3 and partial description in level 4 describe your situation, you could report your Mercalli scale experience as a 3.5 (or three and a half). In the blue and green chart below you’ll notice a Richter Scale reading to the far right. This does not mean that is how strong the quake was. The quake could be much stronger but the epicenter could be 100 miles away. The Richter Scale reading is only an approximation, assuming that your exact location is where the epicenter was located. However, in reality you won’t immediately know where the epicenter was. There are two charts below which are commonly found on the internet. One is not necessarily better than the other. Either one will work to get the job done.